Thanks to Carly Rae Jepsen—and Sabrina!—for inspiring Max to move his arms like that, no small feat when you have cerebal palsy. BlogHer '12 is a mere few days away. In preparation, I've put myself on a special diet and in the name of community and all things good, I'm sharing. My plan involves Milano cookies, nail polish in the shade of Fungus, and many other breakthrough concepts. • Stand in front of your closet. Realize you have nothing great to wear. Go to Shoebuy.com and order two new pair of shoes. Your feet are admirably slender; no muffin top there. • Sit at kitchen table, flipping through the 114-page BlogHer '12 Conference Guide. Whoa. Down half a bag of Pirate's Booty within the first eight pages. • Run around attic searching for luggage you need for packing. Not there. Run down to basement and roam around. Not there. Wonder how it is possible to lose a gigantic piece of luggage in your own home. Run back up to attic and look around more. Oh. There it is. Calories burned: 55. 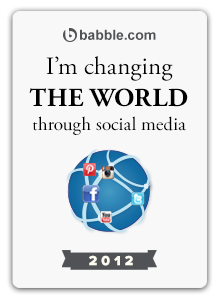 • Read that there are going to be some 4000 people attending BlogHer. Consume half a sleeve of Pepperidge Farm Double Chocolate Milano Cookies in anxiety. • Repeatedly and obsessively check #BlogHer12 hashtag on Twitter. Calories burned: 0. • Polish your toes, in anticipation. The color is supposed to be sheer blue and yet, it goes on looking like you have a toe fungus. "What do my toes look like?" you ask your 7-year-old, hoping it's not as bad as you think. "It looks like you have disgusting toes," she says. Wear closed-toe shoes to work for several days until you have time to change the color. 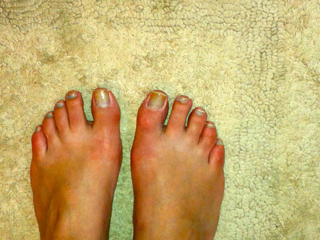 Realize that looking at fungus-colored toes is an excellent appetite depressant. Decide that if you need appetite control at BlogHer, you can return here and stare at this photo. • OMG! OMG! 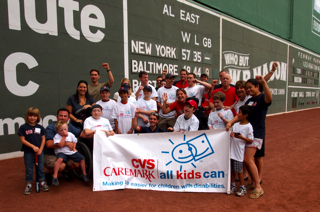 Find out that the program you do work with, CVS Caremark All Kids Can, is sponsoring the Blogging About Your Child With Special Needs panel you're moderating! And they'll be in the audience! 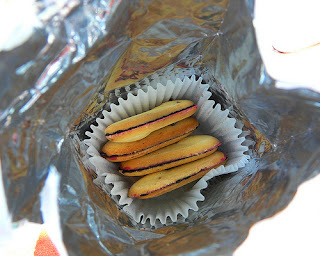 Consume other half of sleeve of Double Chocolate Milanos. • Ponder if, for any conference event, it could be OK to wear your amazingly flattering black yoga pants. Of course! The Come as You Are party! Maybe? • Wonder how many calories you will burn trotting around the Expo, which this year is in three different halls. Admit they might be offset by food samples consumed. A S'mores Suite?! • Think about all the great friends you will be seeing at BlogHer. Vow not to stand next to any of the really svelte ones in photos. • Type up detailed list for husband of activities to do with kids while you are away and pointers on childcare, including reminders such as "bathe the kids" and "if they want ice-cream for breakfast, you can say no." Calories burned from rapidly pounding the keyboard: 9. • Give up all carbs for several days pre-BlogHer, out of desperation. Get so grouchy husband and children can't wait for you to leave. There now. Don't you feel good? I'm starting weekly link-ups for bloggers who have kids with special needs. The idea: share a favorite post of the week. 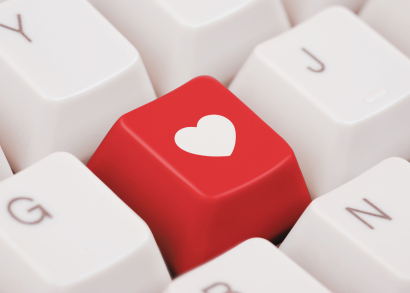 It can be something you wrote, or something another blogger wrote that you loved. It's hard keeping up with each other; hopefully, this will make it a little easier. Like this: Love That Max: I Just Won The Powerball Lottery! Click "Enter." Leave a comment if you want to say more. Done! Oscar Pistorius—aka the "Blade Runner"—made history earlier this month when he was chosen to be on the South African relay team for the London 2012 Summer Olympics, which kick off today. 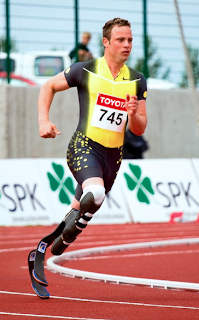 A double amputee, he runs on carbon-fiber blades and will participate in the individual 400 meters and the 4x400 meter relay. Pistorius is the first amputee to compete in track and field at the Olympics. This is a man who's shown the world that he is a great runner, period—not a great "disabled" runner. He's never let his disabilities define him. 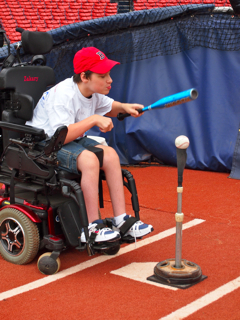 As he's said, "You're not disabled by the disabilities you have, you are able by the abilities you have." This is the man who might just be the most controversial athlete at the London 2012 Summer Olympics. Pistorius was born without fibulas, key bones for the lower leg; his feet had structural problems too. When he was 11 months old, his parents had both legs amputated halfway between his knee and ankle rather than put him through years of reconstructive surgery that had no guarantees. In his autobiography Blade Runner, he recalled to NBC sportcaster Mary Carillo, he tells the story of walking on the beach as a boy and noticing that his feet left impressions on the sand that weren't the same as other kids'. "My footprints are different," he told his parents. "No," they replied, "they're just better." Pistorius took up running as part of rehab for a rugby injury. His legs are j-shaped Flex-Foot Cheetahs, made of layers of carbon fiber (there's a good explanation of how they work here). Some thought the spring in his stride gave him an edge over other runners. In 2008, after making Oscar go through a gamut of intensive tests, the International Association of Athletics Federations banned "technical devices" that "provides a user with an advantage over another runner not using a device." The ruling was overturned the next year by a Court of Arbitration for Sport, saying there was no proof of that. As the man who's made Pistorius's blades for years told Carillo, holding one up, "This thing won't run if someone doesn't make it run." Even now, the blades continue to spark controversy. CBS Sports columnist Gregg Doyel said that Pistorius's competing in the 2012 Olympics would set a "regrettable precedent." A Chicago Sun Times writer wrote, "We're celebrating the will of one human being, but also the science and physics behind the two carbon-fiber prostheses that help a double amputee run fast. We're certainly not celebrating common sense or fairness." Wrong, knucklehead: We're celebrating a talented athlete here. As Sally Jenkins of the Washington Post put it, "Oscar Pistorius's prosthetic calves are hardly his greatest advantage. You can't manufacture his brand of emotional gasoline, or build aspiration out of carbon fiber.... The substance he runs on is called the athletic heart, and there is no external way of acquiring it, and it's why our fretting over so-called 'enhancement' is misguided." Pistorius literally has a winning track record: At the 2004 Paralympics in Athens, he twice broke the 200-meter world record. He subsequently broke records for the 100m and 400m, too. Then he started competing against able-bodied runners. In London, Pistorius will also race in the Paralympic Games. Per the official Olympics 2012 Track & Field Schedule, it looks like his first heat is tomorrow. "I enjoy challenging the way people think," he says in this video. "When they see someone with a disability, they always focus on the disability. That deception is something I want to kind of alter." Oscar is running for South Africa and himself, of course. To me, he's also running for Max, and for all kids and adults with physical disabilities. And in my mind, he's already won a victory for them all. This video of an Israeli couple with cerebral palsy getting married has translation, but words aren't even necessary. I made the mistake of watching it during my commute to work. Dave looked up from his newspaper to find tears pouring down my face. I showed the video to him. "Honey, why are you crying?" he asked. "It's beautiful!" What could I say, on a crowded train? 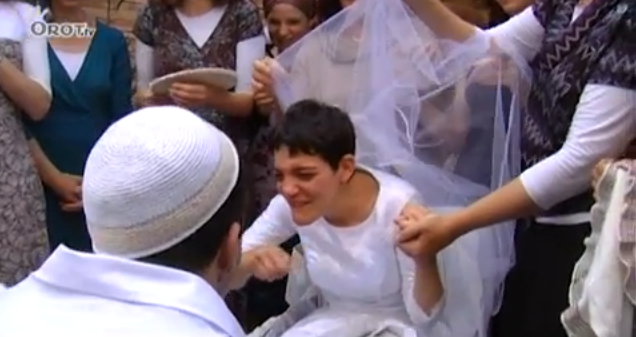 I cried because of how happy this couple is—and how happy I felt watching them. I cried because of all the love surrounding them. I cried because they made it work; the wedding band was on a chain he could more easily slip onto her hand. I cried because I always cry at weddings. I cried because the video opened up the floodgates of my hopes for Max's future. Someday, I hope Max will find love like this. Hit "cc" on the video for captions. 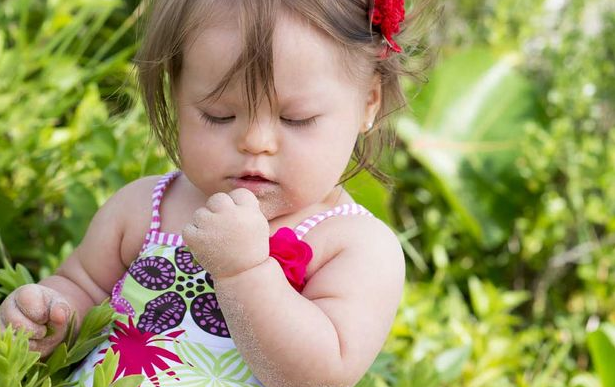 Meet Valentina Guerrero, a 10-month-old from Miami who's modeling for the Dolores Cortés Kids USA swimwear catalogue. She even walked the runway (oh, OK, she got carried). Adorable, right? "People with Down syndrome are just as beautiful and deserve the same opportunities," designer Dolores Cortés told Adweek. Writer S.E. Smith at XOJane went off on Cortés for reportedly issuing a press release about Valentina and putting the tot on the runway. While progress is being made, this writer noted, she decried what she called companies' "persistent insistence upon being recognized for using disabled models" rather than "subtly integrating them into catalogs and advertisements and letting them be seen for who they are." She felt companies are trying to call attention to their "progressiveness." The claim: Companies are "trumpeting" it when they feature kids with special needs in ads and demanding "praise and pats on the back." Reality check! 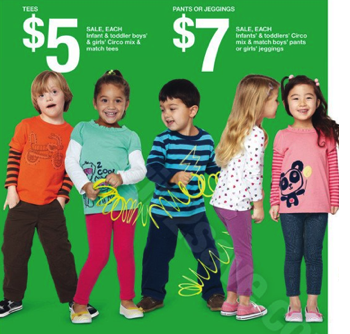 Target has cast kids with Down syndrome in ads for the last few years, including the adorable Ryan Langston. Word about this spread largely via social media. Target, if anything, has been remarkably closed-mouthed about Ryan. Only after a Washington Post writer contacted Target about Ryan did the company issue a statement: "Target is committed to diversity and inclusion in every aspect of our business, including our advertising campaigns. Target has included people with disabilities in our advertising for many years and will continue to feature people that represent the diversity of communities across the country." Nordstrom also featured Ryan, in its anniversary catalog. Again, the company didn't draw attention to it. Neither company seems to have demanded praise or props for their choice of models. The claim: Companies are trying to prove they're "progressive" by featuring kids with special needs in ads. Reality check! Well, yes, this is progressive—as hard as that is to believe in 2012. As much as parents of kids with disabilities may long to see them represented in the media (and generally get treated like other kids), the fact is very, very few children with special needs are featured in mainstream print ads and catalogs. And TV ads? Name one; I can't. The claim: Companies are "exploiting" kids with Down syndrome. Reality check! True, some companies are eager to have models and spokespeople who get them attention. But this isn't Snooki doing an ad for a weight-loss pill. This is a child worthy of being a model—beautiful, smiley, chuba-licious and anything you'd ever want in a baby swimsuit model. Valentina, Adweek notes, is the first child with Down syndrome to be the "main" model for a fashion company. Let's talk about a star being born, not "exploitation." 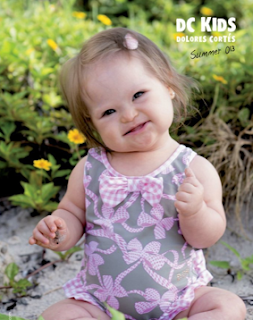 The claim: It's wrong to announce that you have featured a child with Down syndrome, rather than "just subtly integrating them into catalogs and advertisements." Reality check! OK, my first instinct also was it's wrong for a company to get all self-promotional about this. 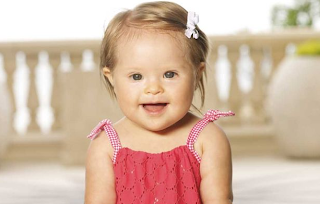 But then I thought it through, and I've decided that if a company chooses to make a big deal out of featuring a child with Down syndrome in their ads it can be a Good Thing. For one, it can help spark conversation about inclusion. Also, the more attention models like Valentina get, the more likely it is that other companies will join in—and the more it has a chance of becoming a "norm." We are so, so far away from that right now. The claim: "Once Valentina is no longer sufficiently cute, she'll be out of work." Reality check! Why the assumption that this beautiful child won't stay beautiful? Are only cutie-pie babies with Down syndrome model material, to this writer? Maybe Valentina will continue to land modeling contracts for her good looks, charm and popularity, if that's what her parents want. Maybe she will give Gisele a run for her money. Who knows what the future holds. I want to see more, more, more kids with Down syndrome in ads. 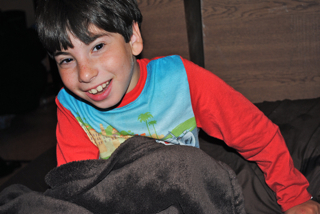 I want to see children with cerebral palsy, like Max, and other disabilities as well. If this becomes a trend then, yippppeeee! And if other companies rush to jump on that trend, well, how awesome would that be? 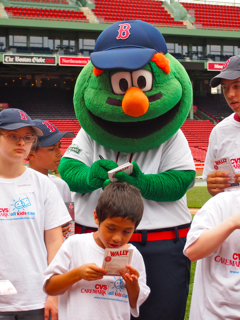 Max and I got invited to CVS Caremark All Kids Can Baseball Camp in Boston. One of us was really psyched to go.... and it wasn't Max. I know how awesome the camp is after writing about it last year. 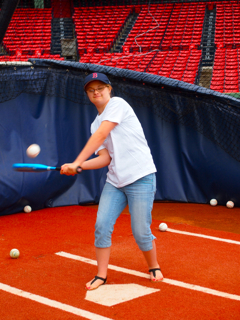 During the one-day experience at Fenway Park, kids and teens on inclusive baseball teams get pointers from Red Sox batting coach Dave Magadan, pitch on the field, get a behind-the-scenes tour and see a game. But Max has stadium-phobia. 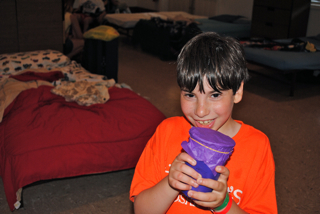 I showed him some photos of the camp and he kept saying "Nooooooo." So off I went. I figured maybe once he saw how much fun I had with the kids there, he'd want to go next year. That old make-him-jealous thing. 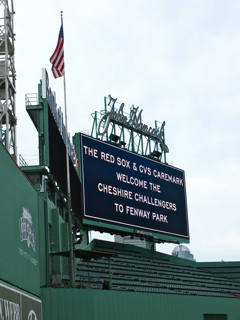 The camp is in its eighth season; the day I was there, the Cheshire Challengers, a Little League Challenger Division from Connecticut, plus one player from The Miracle League were visiting. From the moment the kids lined up outside the stadium to get in, they were beyond excited. 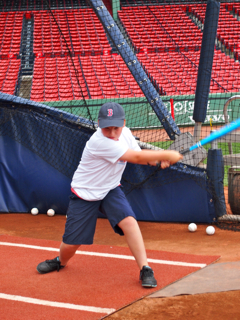 Also cool: It's Fenway Park's 100th season. I didn't think it wise to mention I'm a Yankees fan, though Coach Magadan won my heart. 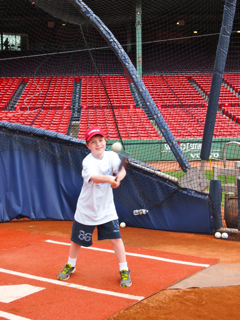 First up: a batting clinic in the batting cage the Red Sox use to warm up and practice. 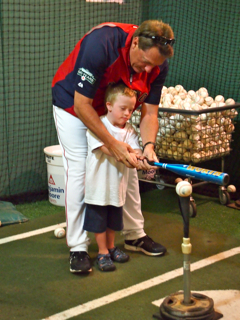 Coach Magadan gave pointers on positioning, swinging, keeping your eye on the top of the ball. But he was also an amazing cheerleader. Next, the kids headed out to the field. It's gloriously green and lush, and I had serious lawn envy. 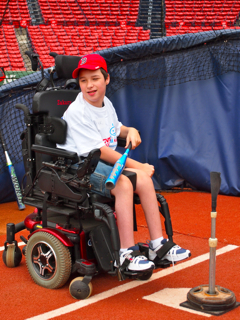 I had a big, loopy grin on my face as I watched the kids at bat, looking determined and proud. I almost got walloped by a ball a couple of times. "I think they're aiming for you!" Coach Magadan said, laughing. 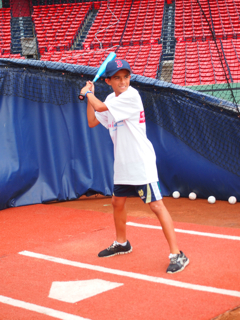 When one kid whacked one out to center field, Magadan remarked that he'd be right at home in the game that evening. 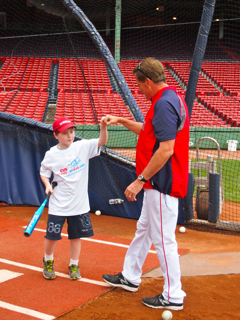 No matter how far a kid hit the ball, the coach was equally encouraging. Right about now, you might be wondering how your child can get involved. 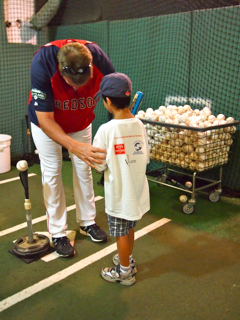 The camp is open to inclusive teams in New England, and accepts 10 different teams each year. Applications are available starting in April or May; keep your eye out for them on the CVS Caremark All Kids Can Facebook page next spring. 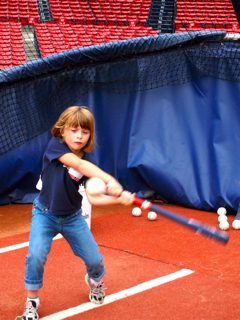 Later that day, the kids returned to Fenway to watch Red Sox batting practice and a game against the Toronto Blue Jays. On the train ride home, I thought of Max and just how much his Challenger team has done for his confidence. 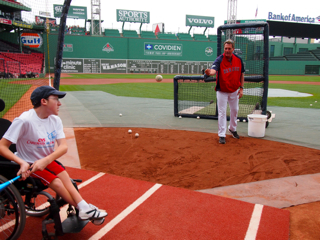 It's certainly changed my idea of what makes for a good baseball game. It's not about how far you hit the ball or how fast you get to a base—it's about doing it on your own terms, as people stand by cheering you on. And that's something generally good to keep in mind when you're raising a kid with special needs. • How to optimize your iPad for a kid with special needs: Smart ideas in this post on Mashable. • A dad who had a stroke learns to talk as his baby girl does: Sweet story from The Telegraph about a dad who suffered a stroke—and got the motivation to talk and walk again by watching his daughter do the same. Like a TV movie, only real life. 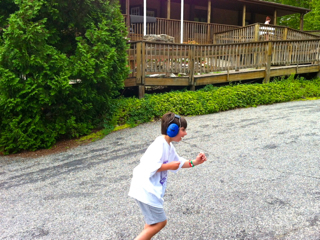 • "Why my blind son is returning from camp a month early": A troubling post by a father about a camp's decision to send his blind teen son home midway through. It'll make you sad. Mad, too. 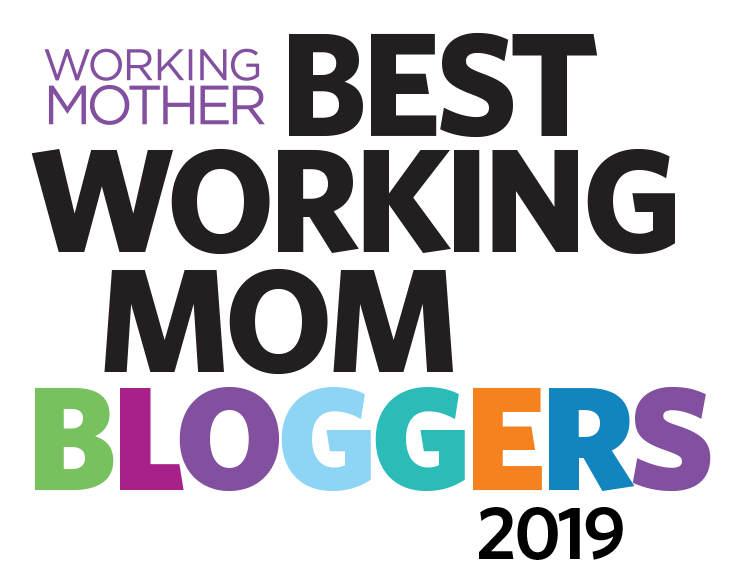 • Planning to be at BlogHer? Hope so! 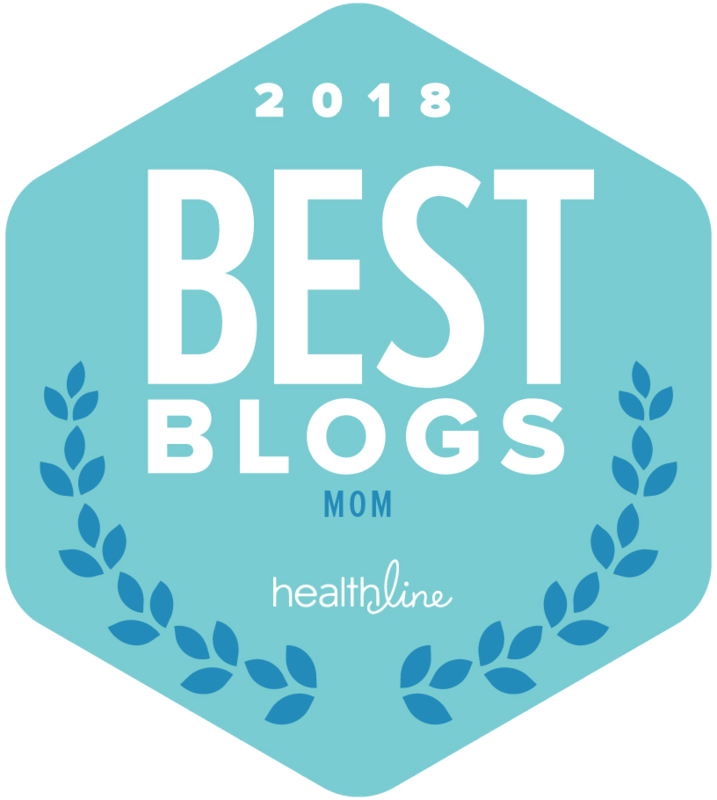 I'm moderating a HealthMinder Day panel on Aug 2, Blogging About Your Special Needs Child, along with Marisa Howard-Karp and Kate Canterbury of The Guavalicious Life. I'd so love to see you there. • Playground summer challenge: KaBoom!, a nonprofit dedicated to building playspaces, is running a 2012 Playground Challenge until Aug 13. For every one your family visits and tags on an KaBoom's app, you'll be entered into a weekly drawing to win gift cards, plus the grand prize trip. 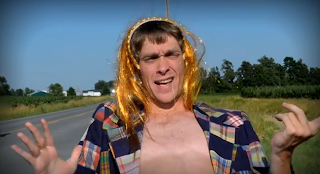 • A new online travel show by my CP hero: Zach Anner, the dude who won the Oprah Your Own Show competition, has moved on to a fab place—aka the web. He's partnered with Reddit for Riding Shotgun, an Internet show in which readers get to pick where Zach goes. You can submit cities and vote on your faves here until midnight on 7/23. Here's Zach, explaining it—enjoy! A kid with cerebral palsy kicked out of a pool for his water wings: WTF? A mom and her son with cerebral palsy had to leave a pool in Pittsburgh because he was wearing water wings: add this incident to a growing file of special needs WTFs. The incident is disturbing on many levels—it ruined a kid's fun, it gave his mom grief, and it once again makes me worry about the blinders people have on when it comes to kids with special needs. The story, as recounted on wpxi.com: Jen Wymer, her daughter and her son, Max, were at a public pool in North Park on Monday. Both kids had water wings on. When lifeguards told her the wings were against the pool rules, she took them off her daughter but asked to keep them on for Max. 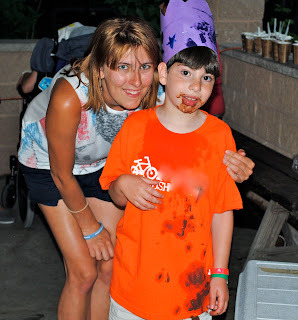 As Wymer tells it, "I went up to the lifeguard and said, 'My son has cerebral palsy. He doesn't walk well and has poor balance. Could he keep the floaties on?'" But she was told, says Wymer, "Rules are rules." When Wymer refused to remove them, the police were called. Wymer took the wings off. After holding Max up in the pool for an hour, she put them back on. When the police returned, according to Wymer, they escorted her out of the pool. A lot of pools prohibit water wings, fearing they give kids (and parents) a false sense of security. But if a child with cerebral palsy happens to have them on, for extra support, and is being held or closely watched by a parent, can't he just stay for the day? The Pool Rules and Regulations listed on the Allegheny County website state that life preservers and water-wings are prohibited in the pool. They also state "Exception: specialized flotation devices for disabled patrons only." Water wings picked up at Target or Sports Authority may not count as "specialized flotation devices" but in this case, they were serving as such. I'm sure the lifeguards at the pool were trying their best to do their jobs. I get that. Safety at the pool is everything. What concerns me is that they couldn't find any way of accommodating this boy. Couldn't they have told the mom, "Just this once, but next time we can't allow it"? It doesn't seem like the pool crowd would have staged a protest—in fact, a woman standing nearby reportedly told the police "She obviously has a disabled child." Assuming the mother wasn't threatening to do them bodily harm with a water wing, did they even have to call the police? Come. On. We want our kids to fit in with other kids and be treated as equals. We want special treatment for them, too. The truth, though, is that these go hand in hand. In order for this Max, and my own Max, to enjoy certain activities—like any other kid out there—occasional exceptions have to be made. Parents may have to take a stand. But hopefully, police won't have to be called. Update! Max is now allowed to wear his water wings at the pool, wpxi.com reports, after his Mom got a doctor's note for them. 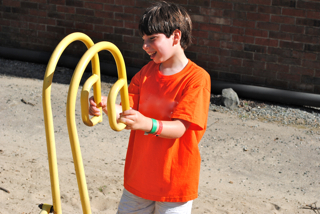 These summer activities for kids with special needs are from Abby Brayton-Chung, who blogs at Notes from a Pediatric Occupational Therapist. 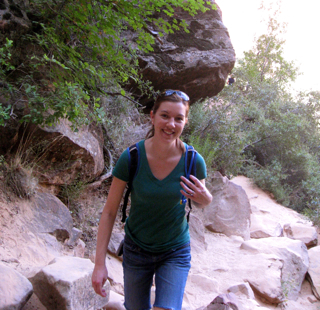 An OT in Southern California, she's worked in schools and Early Intervention. Her summer fun ideas are so genius, kids won't have a clue they're actually doing occupational therapy! Summer is in full swing and boy, has it been a hot one! Today I’ll share some fun activities for kids that take advantage of all that summer has to offer, including making the most of hot days. Oh, and as an added benefit, these activities are great for promoting sensory and motor development too. Paint with ice cubes. Now here’s a way to cool off! 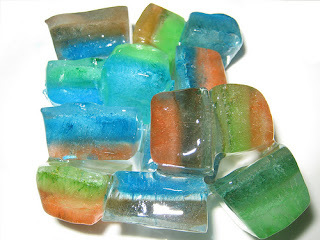 Mix watercolor paint with water, fill an ice-cube tray, freeze overnight, and voila, ice-cube paints! Create a masterpiece on paper or fabric with your ice cube paints, while developing grasping skills and engaging in sensory exploration. 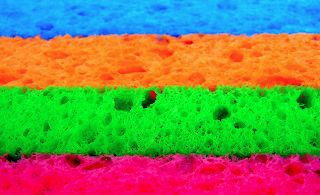 Play with wet sponges. Set up a bucket of water, have sponges handy and let kids go at it. 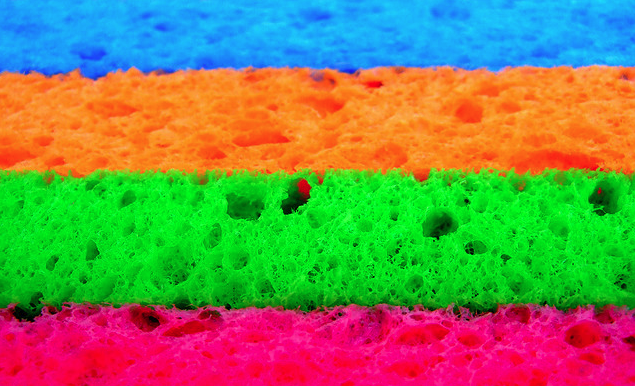 Squeezing water out of wet sponges helps develop hand strength. Get some big sponges to encourage squeezing with both hands. Want to add a visual motor component to the activity? Try throwing the sponges at a target. Want an even more tactile experience? Place a trail of sponges on the sidewalk and walk barefoot on them. This is a great way to work on balance too! 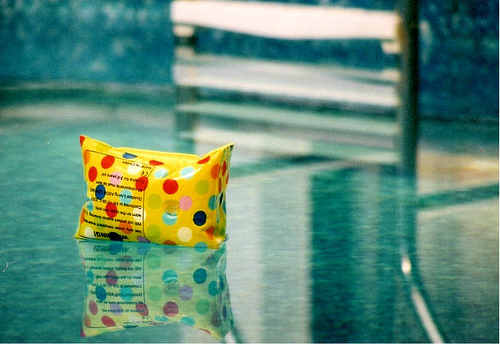 Toss around pool toys. Water is great for children with special needs, especially those with muscle stiffness, as the buoyancy makes it so much easier for them to move their arms and legs. Use a pool noodle or swim vest as you hold or closely watch them, and encourage your child to reach and kick. 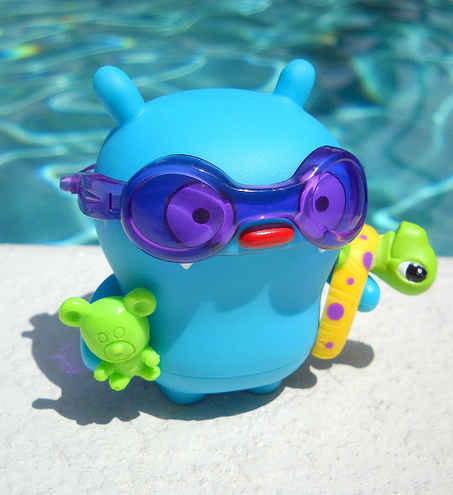 Hold pool toys or balls at arm's length to encourage your child to reach out and move even more. If your child is not ready for a big pool, backyard kiddie pools are just are good. Even sitting and splashing in shallow water helps promote movement. 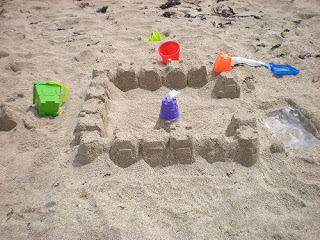 Build a sandcastle. Great for sensory exploration and for developing strength and coordination. And you don’t need anything fancy! Grab some pails or containers, measuring cups and spoons from your kitchen and head to the beach! Let the kids dig in and have fun. Search for seashells and rocks to use to decorate your child’s creation, while promoting fine-motor and grasping skills at the same time. Live too far from the beach? Use a sandbox or (any container that will hold sand) to create castles in your backyard. Squeeze anything that sprays water. Most kids love to get wet, and pretty much all kids love to get other people wet! 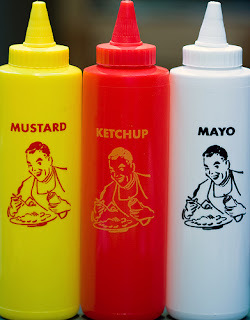 Squeeze spray bottles, condiment containers from the dollar store, water droppers, and anything else you have laying around the house that can be used to spray water. This activity helps develop hand strength and coordination, as well as visual motor skills if you aim for a target (or a person!). Get these spray bottles out when you're creating your sandcastles too. I walked in the door at 11:35 p.m. to find a tornado had ripped through my kitchen. OK, the only actual natural disaster were Dave, Max and Sabrina, who'd been left to their own devices while I was in Utah at the Evo Conference. 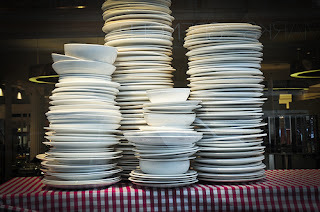 But you would have thought I had ten kids, and several husbands, from the scene: dishes piled high in the sink, toys scattered everywhere, mysterious sticky substances on the floor, newspapers and paper plates and cups all over the table. En route home from the airport and exhausted, I'd had an idea of what lay in wait. Just ignore it until the next morning, I told myself. I decided I'd just open some mail. I picked up one thing off the floor. Then another. Then another. I cleared off the table so that you could actually see table. I decided that I might as well load the dishwasher. I dabbed at some of the sticky spots. I went to sleep at 1:30. Dave and both kids were in our bed, so I crashed in Max's room, curled up with his Cars 2 comforter. Non-news flash: I have a problem with not doing stuff. It can never wait for tomorrow, my brain says, because tomorrow there will be 2,379 more things to do. Some days, the only thing I procrastinate is a bathroom break because I don't want to take the time. At Evo, the digital director of RealSimple.com, Kathleen Harris, shared results of a Women & Time survey the magazine had done of 3,230 women. One out of two women say they don't have enough time (shocking only because every single woman didn't say that). Meanwhile, 60 percent of women said that knowing that all of their chores were done would enhance the quality of their free time a "lot." I know I'm never going to cross off everything off my to-do list. The sticky spots of my life aren't going away. The best strategy, I think, lies in caring less about getting this stuff done pronto. And inventing a self-cleaning kitchen. And a self-cleaning husband and kids. Mostly, though, I need to work on caring less. I recently improved the life of a child with special needs in 45 seconds. That's how long it took me to send an email. A mom messaged on Facebook to ask if I was doing any more iPad giveaways; she has an adopted daughter with apraxia (actually, she has 7 adopted kids, all from the Ukraine). A little later that day, I randomly got an email from a company doing an iPad giveaway. I messaged her about it. She won one. Can I tell you how happy that made me? I mention this not because I want to impress; as you all know, I am no Mother Teresa. I mention this because one of the things in this world that instantly lifts my spirits is helping other people. That can seem like a challenge when you have a child with special needs, who tend to consume a whole lot of your do-good time and energy. But what I know, from the volunteer work I did in my twenties and from whatever help I can give now, is that helping others gives you a high. I call it the dirty little secret of volunteering: You get as much as you give. This past weekend, I discovered some amazingly easy ways to help others. I was at the Evo Conference in Park City, Utah (yes, back again). I did a publishing workshop on writing and getting published with Heather Morgan Shott, who writes the awesome blog High Chair Times on Parents.com. I'd heard how amazingly inspiring the conference was. 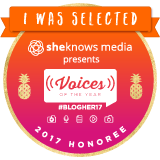 As it turned out, it was inspiration on steroids, full of you-can-do-it-ism and the amazing power of moms to change lives (and the world). 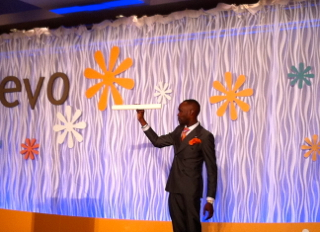 One of the speakers: Derreck Kayongo, one of the 2011 CNN Heroes. Back in 2009 Derreck, a Uganda native, was staying in a hotel in Philadelphia. He noticed that his bathroom soap was replaced daily, even when it wasn't completely used. A son of a soap maker, Derreck was shocked by the waste. As it turns out, every day the hotel industry in the U.S. tosses some 2.6 million bars of soap. Derreck had a lightbulb moment: What if it was possible to recycle the partially used soap and ship it home for people who had no soap? Every year, in impoverished countries including Uganda, Haiti and Kenya, approximately 2.4 million children die from diseases caused by poor hygiene and sanitation. Sickness is easily spread, particularly because people can't afford a bar of soap. Sometimes, midwives are not able to wash up, Derreck told us; they infect the mother and baby at birth, and both end up dying. Enter the Global Soap Project, which started in Derreck's basement. Today, the nonprofit has worked with some 800 hotels and shipped soap to 22 countries worldwide. It all starts in a big warehouse in Atlanta, where volunteers sanitize donated soap, heat it, chill it, recut it and ship it out. "How are you going to make yourself a better human being and inspire others?" Derreck asked us. With just one click on your computer, that's how. Download this brochure about the Global Soap Project to share with the next hotel you stay at. 45 seconds. At the conference, I also learned about an amazing upcoming effort by the United Nation Foundation's Shot@Life, a movement to help save children's lives by expanding access to vaccines (and give them a shot at life). Every day in August, bloggers participating in Blogust will write about someone who's given them a sense of community and support. For every comment left on one of those posts, sponsors will donate $20 to Shot@Life. Leave a comment on a post. 45 seconds. In this amazing World Wide Web we inhabit, together we can do so much World Wide Good in 45 seconds. You can help a child. A mom. Whoever. And it's going to make you feel incredible. So, what do you do when people stare at your child? Catching people staring at your child with special needs comes with the territory of special needs parenting. I do it all the time, watch people watching Max. It still gets to me. There's the curious stare, often from children and sometimes from adults, of "What's up with him?" There's the perturbed stare, typically from adults, of "Oh, something's up with him." I can pretty much tell what they're thinking, because I have DSP (Disability Sensory Perception). And sometimes, it's just a stare. A blatant stare. 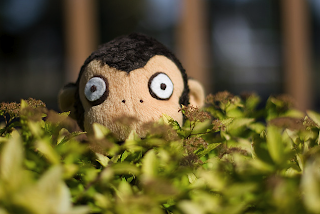 If we're in a park, at a party or in some other casual setting with other parents around, I'll usually just say, "Hi! I'm Ellen and this is Max." And that can break the trance and start a conversation. If it's obnoxious gawking by a total stranger, I've been known to say "You're staring at my child. Is there something wrong?" Usually, that leaves the person flustered. If I'm in a certain mood I'll ask, "I see you staring, would you like his autograph?" Which flusters people even more. I got an email about staring the other day from a woman whose nephew, 15, has autism. As she writes, "He would rather sit in the kiddie section of the pool with the waterfalls and other kid splash stuff than go on the big-boy slides. Most people find it unsettling.... If they aren't staring, they're frowning." "Oh, do you know him? You're looking at him so I thought perhaps you know him?" "Hi, would you like to be introduced to my nephew?" "My nephew is autistic, but he's not rude"
"Do you realize that people who have special needs also have feelings? Do you like being stared at?" One of my favorite ways I've ever heard of dealing comes from blog friend Lana, over at Along Came The Bird. As she once wrote in a guest post she did, "My husband stares right back at them, with this almost maniacal smile on his face. Think the movie "The Shining." Most people get very uncomfortable and look away. And, really, if anyone complains about it, what are they going to say, "That man just keeps smiling at me!" 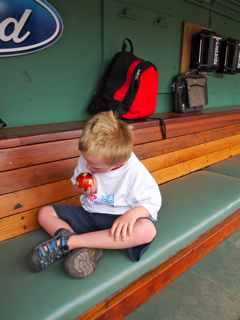 The Affordable Care Act (ACA): Is it a good thing for kids with special needs? I really didn't have a clue how it will affect children with disabilities, and what cons there might be. Then Morris Klein, an attorney practicing in Bethesda, Maryland and the District of Columbia, kindly agreed to answer questions. He is a member of the Special Needs Alliance, a fellow of the National Academy of Elder Law Attorneys and an elder law attorney certified by the National Elder Law Foundation. If you read this and still have q's, Mr. Klein will do his best to jump into the comments section and answer them, so feel free to ask. 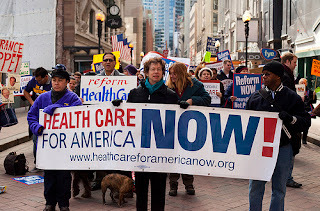 When will changes for the ACA start taking place? In 2014, although some states may seek to delay the deadline because they'll want to see how the Supreme Court ruled before taking any action to begin implementing the program. Can you explain just how the ACA will affect kids with disabilities? • Insurers will not be able to deny coverage for any child based on a pre-existing condition, nor can a premium rate be charged for such coverage. • Insurers can no longer place lifetime limits on many benefits and, beginning in 2014, limits will be eliminated for most plans. • Child-only policies must now be made available. This will facilitate coverage for kids whose parents have employer-provided insurance that doesn’t include dependent coverage or who are being raised by grandparents. • Insurers must offer various wellness programs, such as well-child screenings, immunizations and, beginning in 2014, dental and vision care for children. • Insurers will no longer be able to rescind policies because the applicant unintentionally made a mistake on the application. In the past minor oversights –even clerical errors—have resulted in lost coverage. Previously, pre-existing conditions and lifetime coverage caps have led to situations in which a child’s only coverage option was Medicaid, unavailable to middle class families due to its strict eligibility guidelines. Families will also have access to insurance options through state-based “Health Benefit Exchanges.” There will be federal subsidies to help with the cost of private insurance for families living at the poverty level ($9,220 for a family of four). 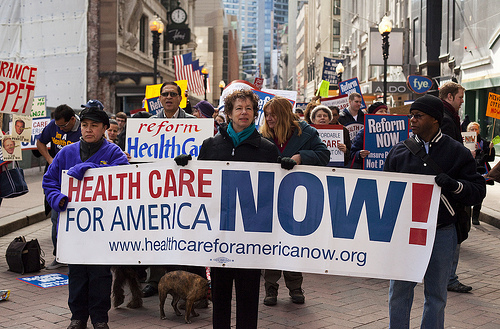 How does the ACA change the Medicaid program? In addition to expanding the number of persons eligible for Medicaid, the ACA requires states to maintain currently eligibility standards and benefits for the Children’s Health Insurance Program (CHIP) under Medicaid until 2019 and to extend funding for CHIP through 2015. CHIP-eligible children who are unable to enroll in the program due to enrollment caps will be eligible for tax credits in the insurance exchanges. What cons, if any, do you see in the Affordable Care Act for kids? Poor persons in states that elect not to expand Medicaid are at risk; we do not yet know how much health insurance will cost once the ACA is implemented in 2014. Also, starting in 2013, healthcare Flexible Spending Accounts will be limited to $2500 per year per family, with annual adjustments for inflation (formerly, private employers could set their own caps on healthcare FSAs). Parents who use healthcare FSAs to pay for services, therapies and equipment for their children not covered by insurance may consider the limit a negative. What are the financial implications of the ACA—can parents expect to save money? How so? People who had to pay for healthcare out-of-pocket because they could not obtain health insurance will benefit. Even people who have health insurance now may save money because additional health services will be covered by insurance, such as vision programs for children. Seriously inspiring artwork—can you guess how it was made? Take a good look at this art. Perhaps that the artist has an excellent eye for detail, and is a master at shading and texture. You might wonder about the medium. I'll tell you what it is: It's a typewriter. Yep, this was all created on a manual typewriter. I'll tell you something else about the artist: He had spastic four-quad cerebral palsy. His name was Paul Smith, and I only recently discovered his story after a reader sent me an email about him; I was so fascinated, I spent the better part of a morning reading up on him and watching this video. Adults like this make my hopes for Max soar. 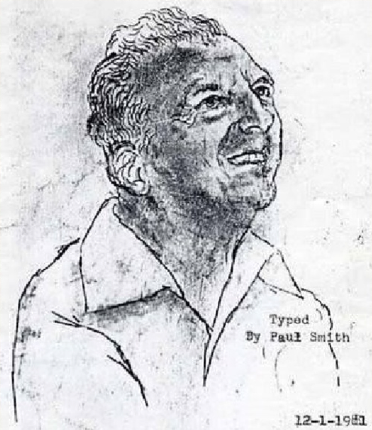 Born in 1921 in Philadelphia, Smith had CP that affected his speech, mobility and use of his hands. Still, he created these images with a typewriter alone. Because he couldn't use both hands at the same time, he'd use one to hold down the other to press keys. Keeping the "shift" key locked, he'd create images largely based on the characters @ # $ % ^ ( ). In seven decades he made hundreds of pieces of typewriter art, some of which took months to create, capturing everything from landscapes to portraits. He died at 85, in a nursing home in Oregon. As the mom to a kid with special needs, I know all about his special powers. Paul Smith is a good reminder to those who don't have people with disabilities in their lives to not underestimate their abilities, talent, or determination. Maybe they get stuff done in a different way, like Paul Smith or the artist Dan Keplinger, who has CP and who paints with a brush secured to a band around his forehead. But they get it done. They're talented. They're as worthy of our awe as any other person. This is what I'd like you to think if you were to meet my Max. Hating on kids with special needs: What can make it stop? After 50 Cent made slurs about kids with autism on Twitter, he raised a whole lot of hackles in the special needs community. The other day, he apologized. I was glad to see it but still, the incident lingers on in my mind. What's it going to take to ease the prejudice against kids with special needs? The brouhaha began when 50 Cent tweeted at a fan, "Yeah, just saw your picture fool you look autistic." He followed up with "I don't want no special ed kids on my time line follow some body else. "And then, attempting to make light of the situation, he added "Just kidding about da special ed kids man, i was in special ed day said i had anger issues lol." "When I read (the tweet) my heart sank. I thought maybe your account had been hacked. No such luck. You went on to joke about not wanting 'special ed kids' on your timeline. Seriously, THIS is how you use your platform of 8 million plus followers??" She proceeded to lay out the stats—1 in 88 kids have autism, 1 in 54 boys do. And then she said she hoped he saw just how "hurtful, immature and misinformed" his comments were. "He has to deal with so much trying to fit in," she wrote about RJ. "This isn't helping." Over the weekend, 50 cent tweeted "I realize my autism comments were insensitive, however it is not my intention to offend anyone and for this I apologize." He took down the offensive comments from Twitter. This follows a familiar pattern: a celeb says something insensitive about disabilities in the media, outrage ensues, said celeb apologizes (well, usually). Really, though, this isn't about celebs, or using your power for good (and 50 Cent does; a campaign behind his Street King energy drink has so far provided 3.5 million meals to hungry kids). This isn't just about the hurtful words people sling around about those with disabilities, though parents will continue to speak out when others insult our kids. The issue here—the one that haunts me and many other parents, I know—is how we can help open people's minds toward children and adults with disabilities. I've thought about this a lot in recent years, as I've seen slurs like "retard" hurled around along with general nastiness slung toward kids like Max. I think about it every time I read about an incident like this, or whenever I see an adult staring blatantly at Max. Part of me hopes that because of the awareness being raised now—by bloggers, by activists like Holly, by groups like Autism Speaks—kids will grow up with more open-minded attitudes toward those with disabilities. Still, it starts with parents: parents helping their "typical" children understand that children with special needs aren't so different from they are. It starts with parents helping kids see that every child has unique abilities and challenges, too. It starts with parents helping kids see the ability in the disability. 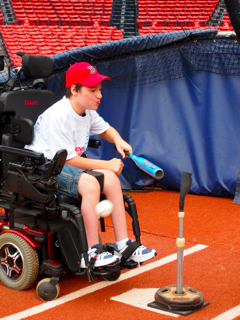 More inclusion would also help—not just at schools but in sports, rec programs and camps. 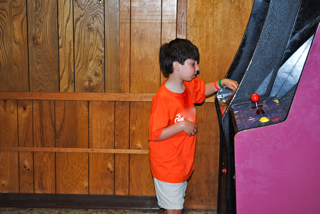 In our state, there is one day camp that has an inclusionary program for kids with special needs. This is far too important for it to be so rare. I'd like to see more inclusion in media, too. The majority of shows for kids, sitcom or cartoon, don't feature children or adults with special needs (excluding Sesame Street). The people who cast actors and models for TV programs, movies, magazines and ads are concerned about having cultural diversity; why not physical and cognitive diversity, too? I ache for Max to live in world that accepts him for who he is. And so, I'll keep doing my part to spread awareness. I'd love to hear your thoughts on what might help people be more accepting of kids with special needs—and stop hating on them. Max returned from his week at camp looking older. It wasn't like he'd sprouted a beard or anything and I'm pretty sure they don't infuse the chocolate milk with growth hormones there, but still, he looked like a lot bigger. So I'm going to assume that a) Max is inching up and b) I don't realize this because I see him daily and c) I am in denial. Max's awesome counselor from last year, Kirsten, requested Max. As soon as he saw her he started laughing and laughing, which is what he does when he's really excited. I am submitting the above one to the Polo Ralph Lauren people, because I think Max has missed his calling as a polo model. Meanwhile, I missed him terribly this whole week. I kept wondering what he was doing, and whether he was thinking about us. The house felt empty without him. "Do you miss Max a lot?" I'd ask Sabrina. "No," she'd say, with feeling. But deep down, I knew she did. 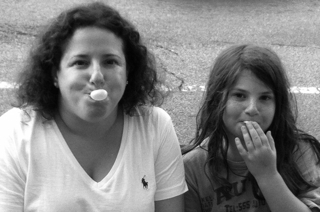 It was nice to give Sabrina lots of one-on-one time and special treats—we rented "her" DVDs from Redbox, got oatmeal cookie ice-cream, played Pengoloo, looked through her baby photo albums, and let her get oversize gumballs from whatever machines she found. We also let her crash in our bed a few times, because this wouldn't be our lives if at least one kid wasn't sleeping with us. Someday, I am going to be dozing off in the nursing home and I will awake to find Max or Sabrina in my bed. 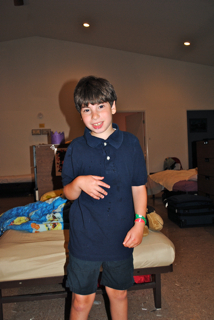 When we arrived at the camp to pick Max up and he saw me, he ran toward me, half laughing and half crying. I swooped him up and he nestled into me and breathed into my neck in that make-me-melt way he does. And can I say how happy I felt? He is getting bigger. But he is still my baby.